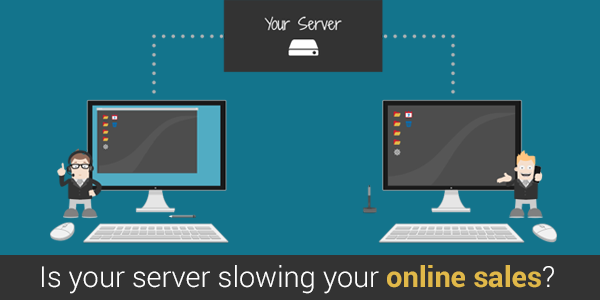 Is Your Server Slowing Your Online Sales? Everyone hates a slow website. In fact, the latest studies prove that if a website takes any longer than 5 to 6 seconds to load, the normal Internet user will be closing the tab and looking elsewhere for their desired answer. It will be like your potential customer leaving your site and going straight into the kitty of your competitors. It is proved that once you lose such a customer, it will be very difficult for one to gain the trust again. If you are still ignoring this fact then this problem will become very nasty and difficult to fix, so here’s what you will have to do? Choosing an appropriate hosting package for the size and type of business website that you are operating will take a lot of time for improving your website speed. It is true, there are numerous on-page fixes you can do too, like minimizing your CSS and image optimization, but the core of your website’s speed will be down to the kind of hosting package that you are using. Personal WordPress blog and smaller sites can get away with a shared hosting plan. These plans are specially designed for smaller websites and personal blogs but make business owner make a mistake of seeing the lower price rates. However, making a decision such as this could eventually be disturbing it. Slow websites can eventually lead to customer loss, on the other hand, shared hosting can also result in downtime too, means even if a customer was willing to continue they would not be able to access the website anyway. No website equals no sales. While choosing a web hosting package it is crucial to go with the one which should suit your business requirements & will allow you to keep your site up and running all times. Big corporations that have the technical staff and budget can opt for their own dedicated server. Which will help them get a flexible and powerful way to serve their website to the public. Smaller companies would have the better option of VPS hosting which is a hybrid solution between shared and dedicated hosting. This virtualization allows you to get the benefits of a dedicated server without the cost or the technical headaches associated with them. Host.co.in best Linux VPS hosting which allows these smaller businesses get a part of a server that is dedicated to them. They are free to run their own operating system if they want to and maintenance and updates are made simpler as they can restart their server every time they wish, giving them a complete flexibility. Selecting the right web hosting provider and package will go a long way to improving your site’s load times. This is good news for your customers and even better news for you. You will be able to see both improved sales figures and better ranking in the search engine, as loading speed is a known ranking factor. So, ensure to double-check your hosting plans today, it could be the key to success you were looking for.